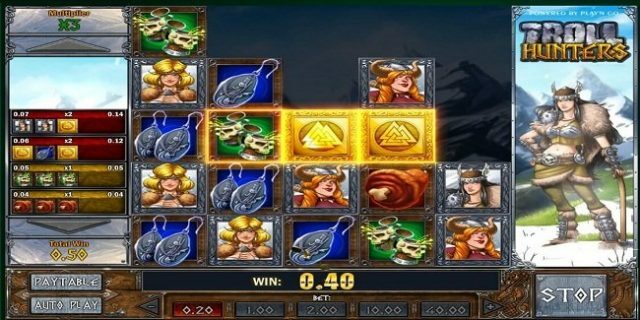 Troll Hunters Slot is 5×5 reel grid slot game powered by Play’n GO software platform. This is not a new game but one of the most played online slots at the internet. This slot game takes you to the Norse mythology. The game includes Viking warriors, ear-rings, and beer mugs to feed the warriors after a day’s battle. The wild symbol in this game is golden Rune which can be substitute for all other symbols. You can play Troll Hunters Slot at Play’n Go Casinos. This is a video slot game for which minimum and maximum coins per line is 1. You can choose coins sizes from 0.2 to 40. The game offers a jackpot of 100 coins and return of the player percentage is 96.73%. The game contains options like “Bet”, “Spin”, “Auto Play” and “Stop”. “Bet” option is used to choose your coin size, while “Spin” option here is used to start the game. “Auto Play” option used to play the game without interruptions and “Stop” option is used to end the auto type mode. As mentioned earlier the game features 5×5 grid board. You can see word ‘Bonus’ behind the symbol. The central symbol in any win turns wild. A player will trigger 10 free spins during the base game. The bonus game play will turn in to a different screen and it would include symbols like battleaxes, shields and swords. The mighty troll will also appear during the bonus game feature. If you land five of more matching symbols on active reel, you would bag a win.